I first saw this recipe on a blog and thought, hmmm maybe. Then it kept showing up again and again so I finally tried it. I've adapted it from what I originally printed out and unfortunately I don't know where I first saw it, but I'll give you the original and notate my changes in red and then you can decide for yourself. We LOVED it. Perfect for a cool winter's night. Place chicken pieces in the slow cooker. Add onions, carrots, celery and parsley. In a medium bowl whisk together stock, peanut butter, jelly, tomato pesto. Pour over chicken and vegetables. Cover and cook on low 5-7 hours or high for **2-4 hours until chicken is cooked through. 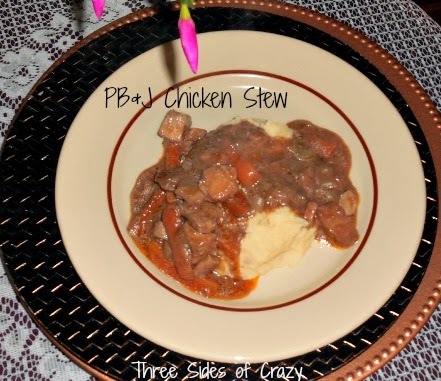 **I was in a hurry and my chicken was not quite thawed which made it easier to cut into chunks. I cooked it on high for 3 hours and it was PERFECT!